Another segment of running an affiliate program you should consider when creating your strategy is affiliate software. Like an affiliate network, it can help with boosting the performance of the program, but there are substantial differences between the two and how each can contribute to achieving your marketing goals. Affiliate software is an interface. It is a technology that enables managing affiliates, tracking sale-related data and even paying commissions. This software has two panels. The first one is for merchants, enabling them to manage their program, set up commissions, add products, etc. Affiliates can also gain access to this software once they join a specific program. In this case, the software enables them to get trackable links, explore all the features of the program, and gain insights into how to maximize their effort to promote this program. A merchant gives access to the affiliate once that affiliate is accepted to join. 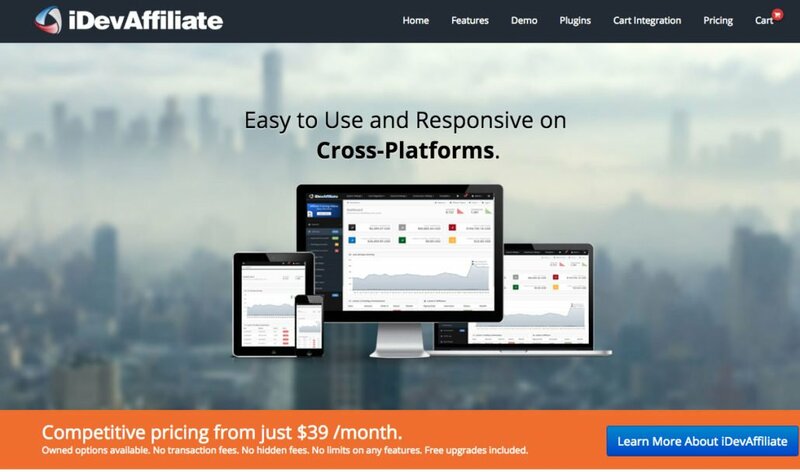 Merchants have two options when it comes to affiliate software. With this type of affiliate software, the merchants purchase the affiliate software license and install the software on their own hosting. Merchants choose this option to gain full control over the software and its installation process. However, this solution requires knowledge and skills to fully integrate the software and start using it to track affiliate campaigns. This is why merchants who do not have the necessary technical skills for such integration need to hire assistance for this process, or can choose the second option. There are no recurring monthly fees involved with this type of affiliate software. Instead, self-hosted affiliate software requires one-time payment after which the merchant gets the license to use this software. It is a fixed expense, allowing the merchants to completely plan their budget for affiliate marketing. Hosted software is a solution for those who want to avoid setting up the software themselves. No technical skills are needed for this option because purchasing hosted software means that you get access to the tool which is available on the company’s server. Once you log in, you immediately get access to the tool allowing you to start monitoring affiliate campaigns and inviting affiliates to join. With a hosted solution, the payment is usually done once, like with self-hosted, but hosted software is more expensive than self-hosted one because it is hosted on the company’s servers. The access to hosted software can also be priced monthly or annually. Although affiliate software offers a lot of useful features and tracking tools, the one thing it misses in comparison to the affiliate networks is the reach. Unlike joining the affiliate network, where the program is instantly available to all of the affiliates who are also members, when hosting an affiliate program through affiliate software, the merchant will have to promote the program separately. There is no community of affiliates who will easily discover the program and who will be ready to join. Once you decide that you want to use affiliate software, you will have to choose the company provider and look into the solutions they offer. Firstly, you should examine the features. There will probably be several payment plans available, depending on the number of features or type of a license used. Also, most affiliate software providers have “Demo” section. This is an incredibly helpful option where you can see the actual platform and check out how this could be integrated into your affiliate marketing. Having made your decision, you are ready to buy the software. Admin panel, also called admin center, is the software from which you manage your affiliate program. It includes everything from settings menu, cart integration, templates, commission, etc. The panel also includes reports, traffic, affiliate data, marketing materials, etc. Essentially, everything about your program is featured here. 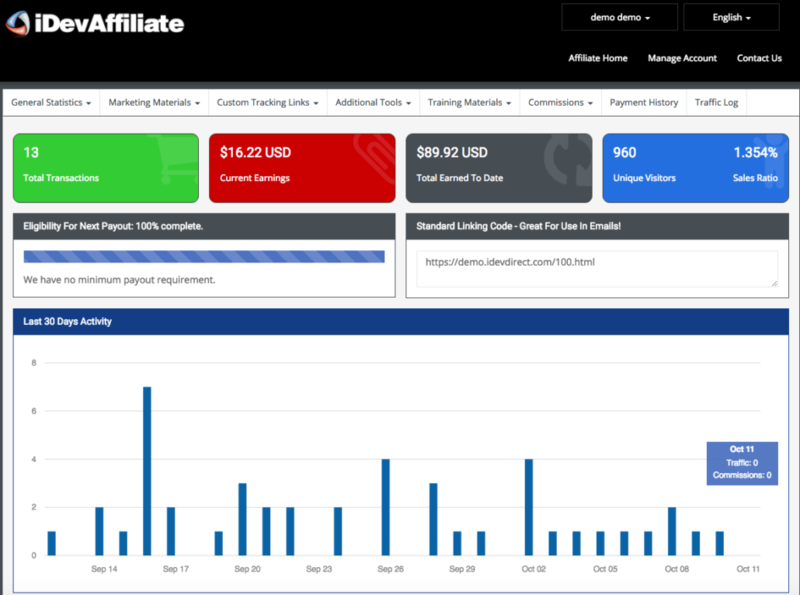 Affiliate panel is the public area of the affiliate program, also called affiliate dashboard. Affiliates join the program through this panel, enabling them to get marketing materials they need to start promoting your affiliate program. This panel also shows them the data about their performance, including transactions and earned commissions. Predictable costs with no transaction fees, or any kinds of fees involved. All you pay is the price of the software, which can be one-time or recurring payment. 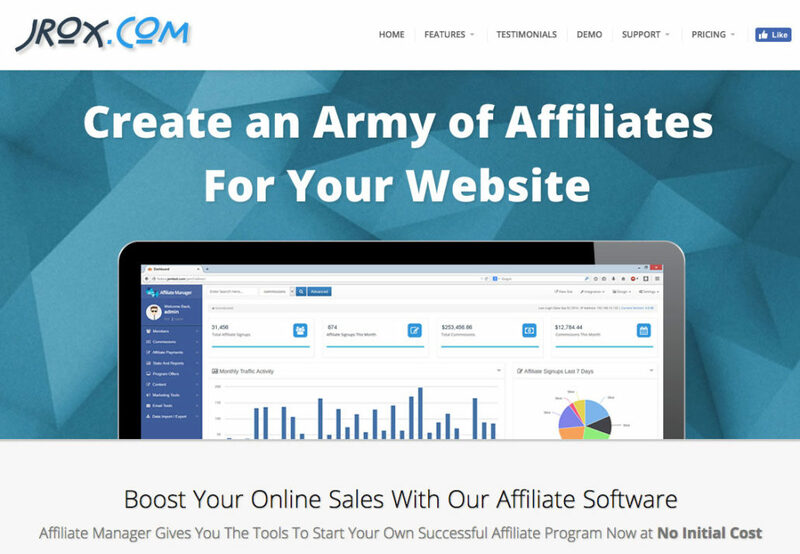 Affiliate software is designed with both merchants and affiliates in mind, and plenty of features are included for hosting and managing an affiliate program. From basic to more advanced features, the companies provide services that vary in price. Here is the selection of some of the most popular affiliate software at this point. iDevAffiliate is a product of the company that has been on the market for over 15 years, with lots of high-end clients, integrations and support system that enables merchants to completely take advantage of affiliate marketing. The company offers both affiliate software solutions for merchants, including self-hosted software (with one-time payment) and hosted software (software is hosted on their own servers, and this plan is subscription-based, meaning there is a monthly payment). Flexibility with designing commission structure (percentage and flat-rate payouts, coupon codes, PPC, PPL or pay per action, affiliate recruiting, etc. Customization features to optimize HTML/CSS templates, language packs, logos, etc. Marketing tools which include banners, page peels, lightboxes, templates, text ads, etc. Over 150 integrations including the e-commerce services such as Stripe, Shopify, BigCommerce, PayPal, Magento, etc. as well as mailing services such as MailChimp, GetResponse, and many others. Online demos are available with a possibility to access and explore both admin center and affiliate dashboard. A hosted solution is called cloud and it is available from $39 per month with a $50 setup fee. There are three self-hosted, downloadable solutions, called standard, platinum and black, starting from $199 as a one-time payment. The difference between these self-hosted plans is the number of features available, as those more expensive plans come with more advanced features, which is why they are recommended for merchants who look for more advanced options in their affiliate program. All plans include unlimited affiliates, commissions, and traffic. AllAffiliatePro is a company that shapes its solution based on the business size so that it can adapt to all different kinds of merchants starting from micro businesses that are only beginning to discover the potential of affiliate marketing to agencies and resellers that need a cost-effective solution to provide support to their clients. When buying this software, you can choose between hosted and self-hosted solution. The self-hosted solution requires your own server for installation, but it does not include any additional monthly fees except for the one-time payment. This payment starts with the Budget plan for Micro and Home Business which is available from $537. More advanced solutions come with more features but can get quite pricey. On the other hand, if you prefer hosted solution where the program will be hosted on AllAffiliatePro servers, you will pay a monthly fee which is based on cost per click method. For example, from 0 to 1,000 clicks, the solution is free. Anywhere from 1,001 to 10,000 clicks, you will pay 0.5 cents per click. When using this system, it might be more difficult to predict the monthly costs at first. All plans come with the unlimited number of affiliates. There is a free online demo. You will need to fill in the online form before you gain access to the demo. Here is one of the highly praised affiliate programs on the market hosting over 30,000 affiliate programs. 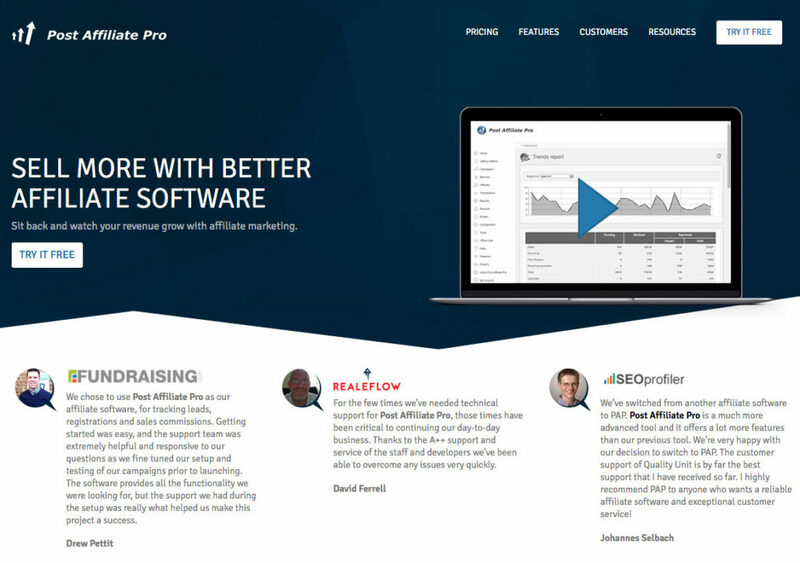 Post Affiliate Pro software is easy to set up with no technical skills required. It supports numerous integrations allowing you to take advantage of affiliate marketing and fully explore the benefits it can bring to your business as a performance-based form of marketing. Tracking methods which include tracking features, fraud protection, codes, private campaigns, etc. Reporting tools with detailed campaign tracking, top URLs reports, top affiliates, trends report, etc. Cloud pricing and plans provide hosted affiliate software with three solutions to choose from, starting at $97 per month. Self-hosted service offers three downloadable software solutions, starting at $470 as a one-time fee. All self-hosted services include full-featured affiliate system, unlimited affiliate, professional features, and free installation. Advertised as an affordable affiliate marketing solution, JROX has been installed by over 10,000 websites so far. Affiliate marketing tools such as social sharing links, ads, etc. Multiple payment options, including PayPal, Mass Payment, Checks, Dwolla, Bitcoin, etc. When it comes to pricing, JROX offers two plans for the self-hosted version. Even though the first one is installed on your website, it is a leased version with $17 monthly costs. It is a budget-friendly solution. The self-hosted software with one-time payment is priced at $179. The cloud-hosted affiliate program without installation to your server is available at $27 per month. The company that provides an easy marketing solution has been on the market for 15 years now. They provide numerous program management and tracking features to run an affiliate program successfully. LinkTrust software is totally integrated so that you can keep everything organized. Some of the integrations include WordPress, Google services, MailChimp, GetResponse, Campaign Monitor, social networks, PayPal, Shopify, etc. The company offers a 14-day free trial period, or you could ask to access a demo version. LinkTrust offers only cloud-based solutions which are available as three recurring payment plans with the most basic being Starter plan available at $199. This plan is limited to 10 campaigns/offers and 10 affiliates. For more opportunities, you will need to choose more advanced (and more expensive) plans. Advanced plans come with a couple of free add-ons, but the company also offers add-ons to be purchased separately. Add-ons are necessary to gain access to full features of the software, but each of them comes with an additional monthly cost. All of this can make the software a bit expensive and more suitable for larger companies and experienced merchants, while beginners in affiliate marketing might want to look for a more budget-friendly option. As you explore the potential of affiliate marketing, you will come across many more affiliate software solutions. What is important to remember is that these programs offer quite a lot of tools for managing and tracking affiliate campaigns, which is extremely handy, especially when you have lots of campaigns and lots of affiliates. Integrations allow you to centralize your work and make things much more organized and more efficient. Unlike affiliate network, affiliate software usually represents a predictable monthly or one-time expense so that you can plan this as a part of your strategy. However, the main drawback is the fact that these programs come with no exposure. This means that you will have the tool, but you will also need to invest into a promotion of this program. You do not gain access to a network of affiliates like when signing up for an affiliate network. When you start exploring affiliate software options, make sure that the program is adapted to your needs. So if you are a small business, just starting out, try to check out more straightforward solutions which offer an opportunity to upgrade as your business grows. You should also compare the pricing options and finally, you will have to choose between hosted and self-hosted version of the software. This decision should be based on your business needs and potential, as well as on how skillful you are with installing and configuring add-on software on your server.